Today we live in a world where everything we do online, every web-site we visit, every search we make is recorded and is available for “data-mining”. Not only that, every electronic cash transaction, every phone call, email, text – even our location through the mobile phone in our pocket, provides information on everything we do, everywhere we go, everything we like and even everything we believe. It is all recorded and stored. It’s not only Google, of course. The information collected by other major tech companies such as Facebook, Microsoft and Apple gives them detailed knowledge of much of our lives, what we like and love, what we do and where we go, what we believe and who we associate with. I’m not sure what we can practically do about all this, but at least “to be fore-warned is to be fore-armed”, to coin a phrase. As for those of us who believe the Bible and trust in the God of the Bible and in Jesus the Messiah, we need to be aware of the gathering clouds so that we can be prepared, be awake and be ready for the Lord’s return, not asleep and dozing like the foolish virgins of Matthew 25. 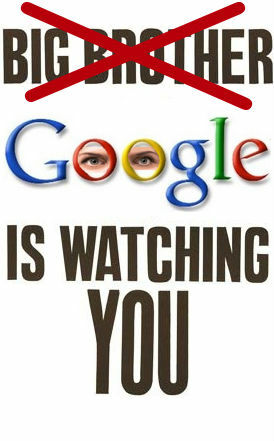 This entry was posted in Blog and tagged 1984, big brother, Google, internet surveillance, watchman. This is great food for thought Andy. Thanks for posting. I could even argue for my own reduction of social media as a response to a fore warning! Thanks Glen. Yes I agree it’s a sobering thought, but so much of how we live these days is online and things like car sat nav, mobile phones and even watches now, feed our info 24/7. I think we certainly need to be aware that our info is being treated like this and be wise. As the ‘internet of small things’ (like our fridges, houses etc) becomes more extensive, and payments become more and more cashless (Apple Pay just launched, for instance) it’s only going to become more of an issue. Might there come a day when all who seek to live for God have to go completely off-grid to avoid being arrested for being Christians? Possibly, maybe even probably, certainly during the tribulation period. Indeed, and dare I suggest that there might be a 666 in there somewhere!